It’s that time of year again, the holiday season is upon us! 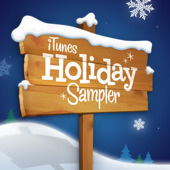 What better way to celebrate than to download a hoard of free Christmas songs from Apple, courtesy of iTunes? From Barry Manilow to Amy Grant to Weezer to Aretha Franklin, this is quite a diverse set of holiday songs that are sure to get you in the spirit. Head on over to Apple, launch the link in iTunes, and enjoy your free music! If you want some more free Christmas tunes, check out the compilation of home recordings my friends and I put together. All free and all genuinely from the heart!